That painting depicting the siege of Minas Tirith seems way out of scale to what Tolkien described. Rohan brought 6000, which would have been useless against that horde. 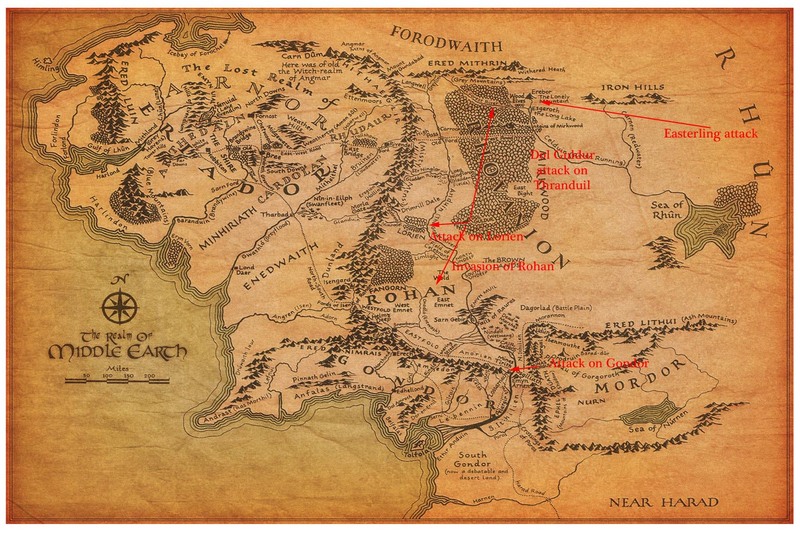 One thing Tolkien got right was the size of the armies. I thought he did kind of depict the heroism of golden knights. We see feudal societies at the top level – but not much is said of all the servants who bring them meals, etc., in Rivendell and elsewhere. (Imagine being an immortal who has to empty Elrond’s chamber pot for thousands of years.) All the kings on the Good side are noble. I wouldn’t probably have wanted a warts-and-all, Song of Ice and Fire approach but it’s a bit like The Godfather level of an organization rather than Donnie Brasco. Tony Robinson (aka Baldrick) did a show called The Worst Jobs in History. Even in Middle Earth there were a lot of elves, dwarves, and humans doing a lot of really dirty jobs. Or, it’s like Upstairs, Downstairs (or Downton Abbey) if they only showed us the Upstairs. Or…Harry Potter if we never see or hear anything of the House Elves.